I play the saxophone and enjoy incorporating it into my costumes when able. 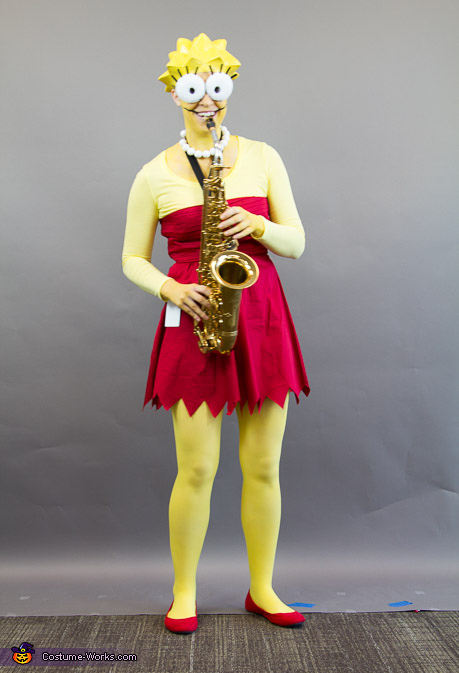 I decided to dress up as Lisa Simpson from TV series "The Simpsons" and bring my saxophone to perform the riff from Baker Street as Lisa does in the show, as well as play The Simpsons theme song. I purchased the basic costume from a store (dress, hair headpiece, and necklace). Bright yellow leggings/tights and long-sleeve shirts are nearly impossible to find in October, so I purchased white tights and a shirt and dyed them yellow myself (which turned out amazing!). I painted my chest, neck and face to continue the yellow body. The eyes are homemade, gluing hand-carved rounded styrofoam discs to plastic glasses frames without the lenses; I added black pipe cleaners for the eye lashes, and cut out a tiny circular hole to see through. Although you are not able to hear my performance and see the costume in action, I assure you that all my coworkers at work enjoyed it!